As a soccer coach you have two main responsibilities and these include helping each player develop soccer techniques and skills and combining skillful players into a team. In order to do this, you must understand how players learn the game in practice and how your players can apply their learning to actual games. Coaching the game involves more than knowing skills and techniques though. There are several principles to follow and if you fall short in any one of them it can affect the outcome of your coaching. Effective coaches understand how to motivate players by structuring practices that are fun, setting reasonable goals, letting each player experience success, and rewarding effort. Failure to give praise to players that are trying hard can cause them to lose motivation. Improper motivation has the same effect. Do not use comparisons against other players as a means of motivation as it will only backfire. Players learn best by observation and practice so it’s better to have simple demonstration rather than a long, drawn out explanation. If players know you’re proficient as the coach, they’ll have faith in what you say. Be able to demonstrate, as best that you can, any new technique. Praise players that do it better than you. Don’t make the mistake of giving no demonstrations at all or you will likely lose the respect of your players. The manner of communication will affect how players accept what you have to say. A big mistake coaches make is being monotonous, dull, and boring when introducing a new strategy or technique. Do not make demonstrations confusing and complicated as you’ll lose the attention of your players. Coaches also make the mistake of using fancy soccer jargon when it’s unnecessary. This can alienate new players and not make them feel part of the group. Great coaches can analyze what a player does and offer constructive criticism. Poor coaches over-criticize and do not offer good points coupled with aspects that need correction. Look into a player’s performance rather than at it. Don’t look for errors but rather take the mindset that the player is doing well but needs a few tweaks. Young players can be easily hurt by strong criticism so be sure to tone it down when giving it. If a team appears to be in disarray and is clearly confused, this is an indication of coaching and not player attitude. Coaches that aren’t well organized will run into the problem of poor performances from their players. Practices should have a strategy and this should be communicated to the players so that the players have every opportunity to execute. 4 Responses to What Are The Biggest Mistakes That Soccer Coaches Make? I think you make five excellent points that can be applied to any coaching situation. The last of these, “determining coaching objectives”, is key as it sets up the other four. Thanks for a terrific article. I think analyzing player performance is key to putting that player in the position that he can best help the team and build his own confidence. 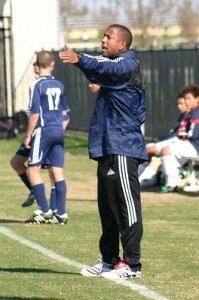 Many high school coaches try to impose techniques and systems they have seen used by high level pro and international teams on youth players, who are at a much lower skill and tactical level.